Eric Martinez spent six years as executive vice president of claims and operations for AIG in New York. In the course of handling 30,000 workers compensation claims a month, he concluded that insurers were investing big bucks in medical management programs for injured workers but not addressing why the injuries were occurring in the first place. Wearable technology was all the rage a few years ago, but it has not taken off as quickly as anticipated. Risk management experts believe wearables will ultimately have a significant impact on workers comp and other commercial lines. The construction and manufacturing sectors and material-moving organizations have shown the greatest interest in wearable technology. Martinez left AIG in 2016 and headed to Clemson, South Carolina, to find that better way. Today as founder and CEO of Modjoul, he’s a pioneer in the field of wearable technology. His company is marketing a “smart belt” that can track everything from workplace falls, lifts and strains to the actions of forklift drivers or environmental conditions that pose safety threats. Wearable technology encompasses a wide range of devices, clothing items, sensors, monitors and other equipment that can identify problem areas; collect environmental data; provide information on the location, physical condition and actions of individual workers; and sound alerts about dangerous developments or accidents. And that’s just a partial list. A few years back, wearable technology was all the rage and was being widely characterized as a game changer in the world of workplace safety and workers compensation insurance. But it has not taken off as quickly as anticipated, prompting some skeptics to question whether wearable technology will be the transformative force in workplace safety that was once hoped. Nevertheless, despite the slow liftoff, most risk management experts are convinced that wearable technology will eventually have a significant impact on workers compensation and other commercial lines. Jim Smith, of Gallagher, concedes that wearables have not yet gained traction in the workplace, but he says they’re gaining in popularity. A regional leader for Gallagher’s risk control and safety services, Smith sees “great potential” for wearables to limit or minimize lifting injuries and to protect lone workers in isolated places, such as a water treatment plant. “Wearable technology is critical if you look at some of the positions we have today. It used to be that some of these places had two or three people, but now there may be only one, and that lone worker is out there with only limited communication. These sensors can track them and make sure they’re OK,” he says. Hernandez says Chubb recently partnered with The Ohio State University’s National Center for the Middle Market and found that 40% of the middle-market manufacturers surveyed either use or plan to use wearables to monitor employee movement and location. Also, 63% said they either already use the technology to measure environmental conditions or plan to use it in the next five years. Wayne Maynard, a product director in Liberty Mutual’s risk control division, says he has been approached by a number of startup vendors anxious to get into the wearable space and is working with several to help improve the accuracy of sensors that collect work-related information. Maynard says employers considering wearables also need to be aware that there is a lack of scientific studies showing that either a certain type of device or wearables in general have actually had an impact on workplace safety. Some of the greatest interest in wearable startups is coming from the construction and manufacturing sectors and material-moving organizations, such as warehouses, that want to make their workplace safer. The algorithms need work. Now a lot of work is in pilot, and there is no research whatsoever that this technology is preventative. If you have a vendor that knocks on your door and says this will prevent 80% of your back claims, just know they have no evidence to back this up. That is not to say companies can’t have great successes with their product. And going forward, I expect there will be good studies on the preventative capability of the products. According to the Bureau of Labor Statistics, there were 5,190 fatal occupational injuries in 2016, a 7% increase over 2015. 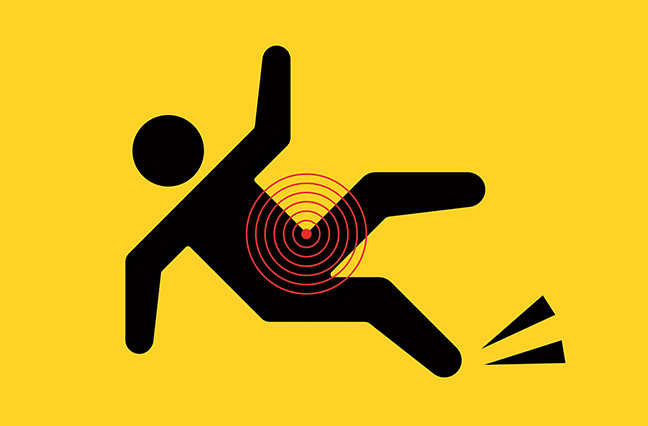 Fatal work injuries from falls, slips or trips continued an upward trend that began in 2011. A recent study by Nationwide Mutual found that more than 30% of the workers compensation claims in the construction industry come from falls from elevated surfaces. And according to The Construction Chart Book, published in February by the Center for Construction Research and Training, 3.6% of employer compensation costs in the construction industry was spent on workers compensation, 71% higher than the spending percentage for the entire sector of goods-producing industries. Gilbane Building Company, a large construction firm headquartered in Providence, Rhode Island, was an early user of wearable technology and sings its praises. Don Naber, senior vice president and director of risk management, says the company has been using the Spot-r line of wearable and sensor devices developed by Triax Technologies of Norwalk, Connecticut, for about 18 months. Pete Schermerhorn, president and chief operating officer of Triax, said Gilbane and a number of other large general contractors across the country are using Spot-r and have been alerted to several falls, enabling them to get medical personnel to the scene of the accident quickly. In addition, management has received some push-button alerts from workers wearing the sensors who are concerned about a possible safety issue. “We’re definitely seeing an enhanced safety culture on these sites,” Schermerhorn says. “In terms of a reduction in claims, we haven’t been in the market long enough to amass that data, but certainly that is where this is going. In addition to location, the sensor lets the company know who fell, which subcontractor that individual works for, and which other workers were in the general vicinity of the incident. And Naber says the fall alert has provided another, unexpected benefit—the ability for both the workers and the company to change behavior. “At one of the projects where we first used it, we were finding a lot of falls. We would go to the person involved, and that person would say, ‘I didn’t fall,’” Naber recalls. “When we looked at the data, we found these alerts were falls from two or three feet, when people actually were not falling but jumping down rather than using appropriate exits we had made available or jumping down from the back of a pickup truck rather than stepping down. Spot-r devices also provide an alert when the construction site needs to be evacuated in an emergency. Naber says it is still too early to see an overall impact on the company’s safety record. “But based on the behavior change that we have seen on a couple of projects because of this, we firmly believe that, in time, we will see a reduction in terms of our overall loss experience as well as loss from a questionable claim or fraud situation,” Naber says. Another company, Eby-Brown in Naperville, Illinois, is just beginning a trial of Modjoul’s SmartBelt in hopes it will help cut down on muscular and skeletal injuries. Eby-Brown is a distribution company that stores, supplies and distributes virtually every product found in convenience stores except for alcohol and gas. The company has warehouses in eight states and employs about 2,500 people. “Our warehouses are not an ergonomically friendly environment,” says Paul Brandel, the company’s risk and claims manager. “Some people are 6’5” and some are 5’2”, but the racks don’t change size, so there is a lot of twisting, reaching and bending to load trucks so the drivers can distribute the products. Modjoul is the first wearable product Brandel is testing. He also plans to test four other wearable products, some of which clip on to a belt and others that clip on to a shirt pocket or shirt. When we looked at the data, we found these alerts were falls from two or three feet, when people actually were not falling but jumping down rather than using appropriate exits we had made available or jumping down from the back of a pickup truck rather than stepping down. Martinez says the SmartBelt can measure worker location and motion as well as environmental factors such as ambient temperature and humidity outside and around the worker. The belt vibrates if a worker bends more than 60 degrees, and it also tracks walking, standing, twisting, squatting, and outdoor and indoor driving. Using statistics from some sensor devices placed in automobiles, Modjoul’s Martinez projects the SmartBelt can reduce workplace injuries by 30% to 40%, though he acknowledges there’s no concrete evidence to support those numbers. Martinez also thinks the time is right for wearables. Naber says his company has overcome resistance from employees and subcontractors skeptical about wearing the sensors by assuring workers the monitoring starts and stops at the job site. Schermerhorn says the Spot-r sensor is small—“literally the size of an old pager.” On some sites, workers receive the sensor at the beginning of the job and take it home at the end of the shift. On other sites, they return the sensors at the end of each workday. Either way—and this has proven critical to worker buy-in—the employee is monitored only when on the job site. Another potential issue involves the use of information gathered by the wearable sensors for purposes other than the stated intent. If workplace sensors are used to monitor time and attendance and an employee is fired as a result, Kolton says, the employer could be subject to a wrongful termination claim. Fred Smith, head of U.S. mining and metals at Willis Towers Watson in Knoxville, Tennessee, says he isn’t aware of any resistance to wearables from the union representing miners. (See sidebar: “A Light in the Tunnel.”) But the technology also may be too new to have captured much union attention. The AFL-CIO did not respond to several phone calls and emails seeking information on union concerns over wearables in the workplace, and a spokesman for the International Brotherhood of Teamsters said the union was not aware of wearables being an issue for any of its members. But that could change fast if companies seek to monitor their employees after they leave the job site. For example, airline pilots do not wear any sort of monitoring devices now, but they are subject to frequent blood tests and physicals to ensure they are healthy and not drinking alcohol before they fly a plane. Similarly, a wearable device might alert a trucking company if a driver was overtired or had been indulging in performance-impairing substances such as alcohol, marijuana or other drugs. But would that be considered an invasion of privacy? Monitoring workplace activity has historically been permitted by the courts, but the courts and regulators have stopped short of setting legally permissible limits to that monitoring. Issues of privacy on what can be reported to whom may also arise as issues that need guidance or that spur court actions. In addition, if the information being gathered falls into the area of health data or other sensitive areas, there is the issue of data security to consider—no small feat in the current cyber environment. We’ve had over 5,000 deaths in 2016, and we are spending $59.6 billion a year in workers compensation medical costs, expenses and wage replacement. That is just unacceptable. We’ve got to do a better job. If wearable technology does become a significant force in improving workplace safety, its impact on workers compensation costs will probably not be felt in overall workers comp premiums for at least three years, says Lynch, the I.I.I.’s chief actuary. But an individual company’s rates may go down if their safety initiatives—whether wearables or not—result in fewer accidents and claims and a better experience history with their insurer. Jim Smith is less concerned about wearables’ impact on workers comp premiums than he is about the potential reduction in workplace injuries and deaths.